From frozen deep fry at 400ºF for 6-8 minutes or until golden brown. Royal Chocolate, Carrot Cake, Coffee Liqueur, French Vanilla Coffee, Cookies'n Creme Brownies, Triple Chocolate Brownies, White Almond Bonbons, Red Velvet, and Milk Chocolate Bonbons. A sundried tomato and fresh herb tart shell filled with a creamy mixture of Kalamata olives, artichokes and goat cheese to create this decadent hors d'oeuvre. A savory piece of beef tenderloin accented with mushroom duxelle wrapped in a French-style puff pastry. A large butterflied shrimp dipped in a mild coconut batter and rolled in a mixture of coconut and bread crumbs. Chicken tenderloin marinated in a delicious blend of fresh peanuts and Thai spices on a 6 inch skewer. A colorful mixture of Chinese vegetables tossed with soy sauce, sesame oil and a touch of fresh ginger wrapped in a mini spring roll wrapper. 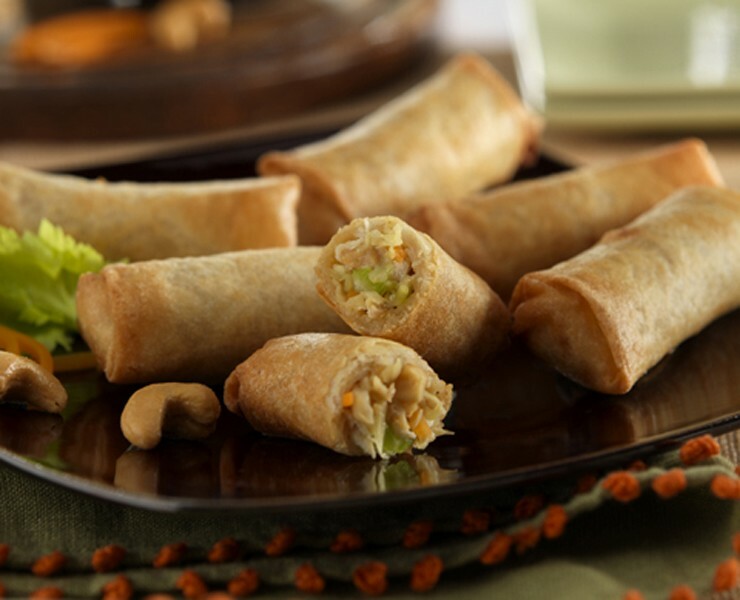 A wonderful blend of crab meat, cream cheese and Oriental flavors wrapped in a wonton skin.